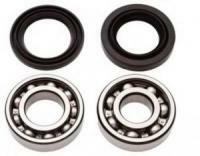 Front Wheel Bearing Kit. Includes two bearings and seal for one wheel. Two kits required for both front wheels. Note: KT2 series use the same bearing for rear wheels.